ASHBOURNE, DERBYSHIRE, UNITED KINGDOM – The Prophet of a British Mormon sect is challenging Pope Francis to come clean about possible “secret Gospels” hidden in the Vatican’s vaults and release them to the world. Matthew P. Gill, the Prophet, Seer and Revelator of the Latter Day Church of Jesus Christ, says the new pope should be honest with the world about the Vatican’s contents. There were many books not included in the New Testament Christian scriptures by the Roman Catholic Church, and many were unknown until the 20th Century. In 1945, a large cache of Gnostic Gospels were found in Egypt, and last year, a scrap of papyrus was acquired and translated by a Harvard Divinity School professor showing evidence that Jesus was married. Gill says the world should be told about all such writings. “There are likely to be many such unknown fragments that could shed light on the earliest years of the Christian Church, and we all deserve to know about them,” he said. Gill’s church, which is not affiliated with the Utah-based Latter-Day Saints, traces its origin to the revelations Joseph Smith, Jr. in 1830 and Gill's revelation of the Book of Jeraneck in 2006. Latter Day Mormons believe in ongoing revelation by Gill, the Living Prophet, but do not believe in polygamy, and reject the authority of all Latter-Day Saint prophets after the death of Joseph Smith, Jr. in 1844. They are online at www.latterdaychurch.co.uk. In his first weeks in office, Pope Francis has made statements to the effect that he wants to govern a more open church. I applaud that effort, but I challenge him to fully live up to his word, and release a list of all materials lying in the dark recesses of the Vatican about early Gospels of our Lord Jesus Christ. Gospel fragments have surfaced throughout the last century that have given us new insights into the Lord’s message and teachings. This includes the Gnostic Gospels and the Gospel of Judas, which Catholics have known to have existed since the time of Ireneaus, a Catholic Bishop living around AD 180, but has only been published within the past decade. What other Secret Gospels and writings has the Vatican withheld from Catholics and the rest of the world? There are likely to be many such unknown fragments that could shed light on the earliest years of the Christian church, and we all deserve to know about them. With the greatest of respect, I challenge the pope to immediately release a full list of Gospels and fragments of Gospel writings hidden in the Vatican, whether or not his church will be embarrassed by their contents. Only then will we know Pope Francis is serious about living up to Christ’s words, "The Truth shall set you free." 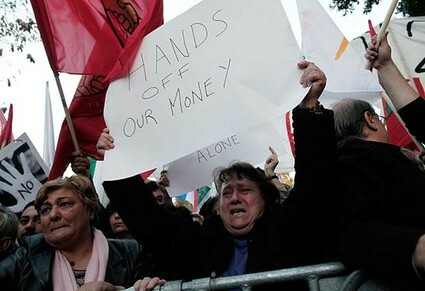 I have to commend those protesting the Cyprus bank account levy for creating protest signs in ENGLISH. From a PR point of view, this is just smart. Protest signs written in English allows UK and American news cameras to capture the anger in a way that appeals to news consumers in the UK and US, and even Europeans, most of whom read English. It instantly transforms what could have seemed a far-off problem - with signs written in Greek, which is literally "Greek" to most Americans and Britons - to something close, easily understandable and "real." Signs legible to hundreds of millions of people around the world allows the protest to be "branded" as something of international, not just local, interest. And that makes it far more valuable as a news story. This is even more amazing, since a small number of signs have been effectively transformed into the LOOK of this story for days now. This shows the power of the idea of non-English-speaking protesters appealing to English-language readers. 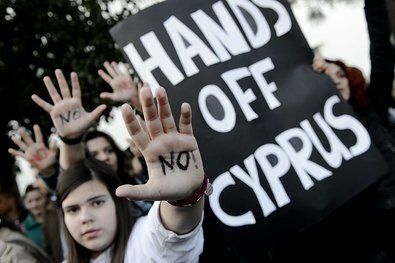 I often wonder why protesters in Middle Eastern nations like Egypt and even in the Palestinian West Bank don't use more signage in English, and adopt protest techniques proven to be successful in Western nations. 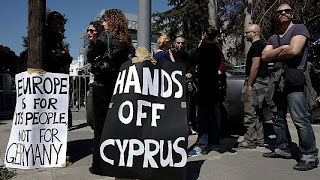 My advice to them is to watch the Cyprus experience and learn from it.